It was a very mixed month for world equity markets, with net monthly changes ranging from +2.2% (USA), +1.3% (Japan), +1.0% (Australia), -1.9% (France), -3.2% (Brazil), -3.4% (Germany), -4.1% (Greece), -4.8% (Spain), -5.2% (China), to -6.9% (Russia). M/t outlook offers upside into year end. 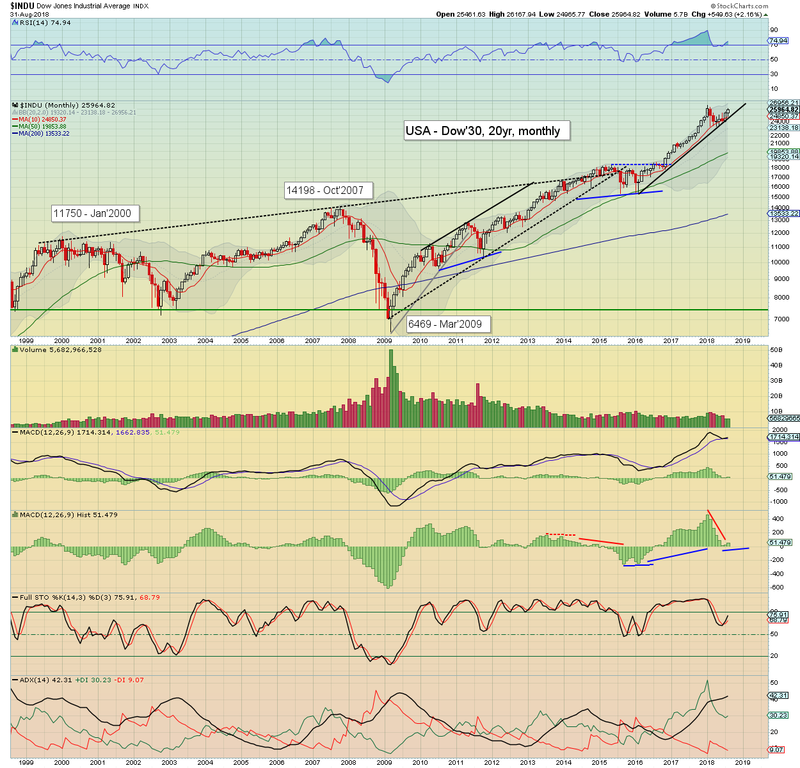 The mighty Dow climbed for the 4th month of 5, settling +549pts (2.2%) to 25964. 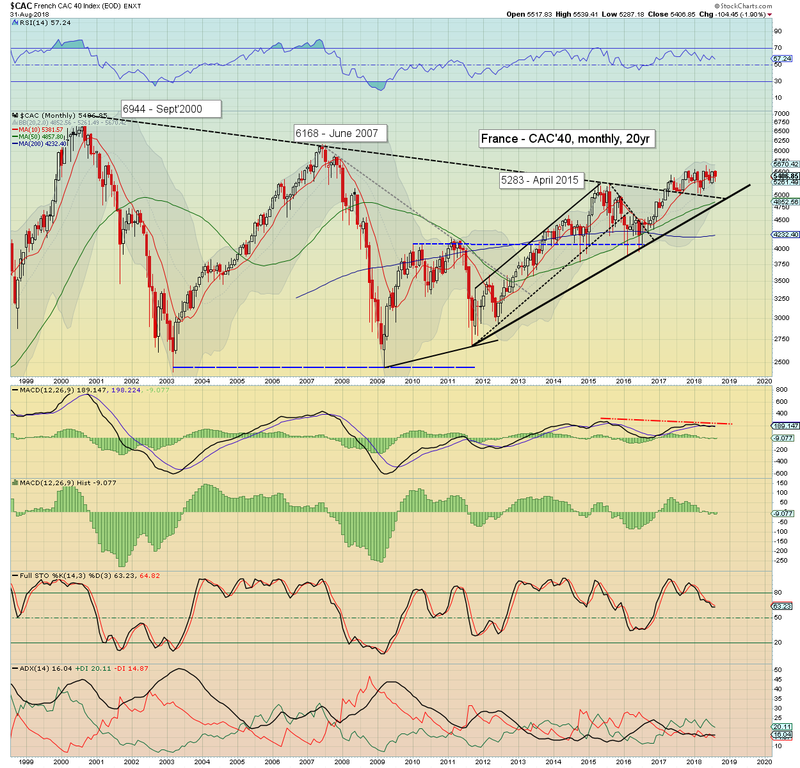 New historic highs (>26616) look viable from late Sept' onward. Note the underlying macd (green bar histogram) cycle, which ticked higher for a second month. Best guess: Whilst September-October can be a tricky time, the short/mid term outlook has to be bullish. We've seen a couple of significant corrective waves this year, and its arguable that the bears 'had their time' from late Jan' to early April. Keep in mind the next key fib' of 26702. Any price action >26800s would be decisive, and offer a grander run to 33/34k in 2019. For the record... 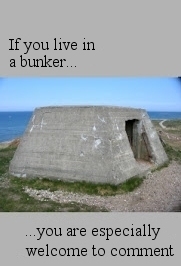 I do expect the latter next year. 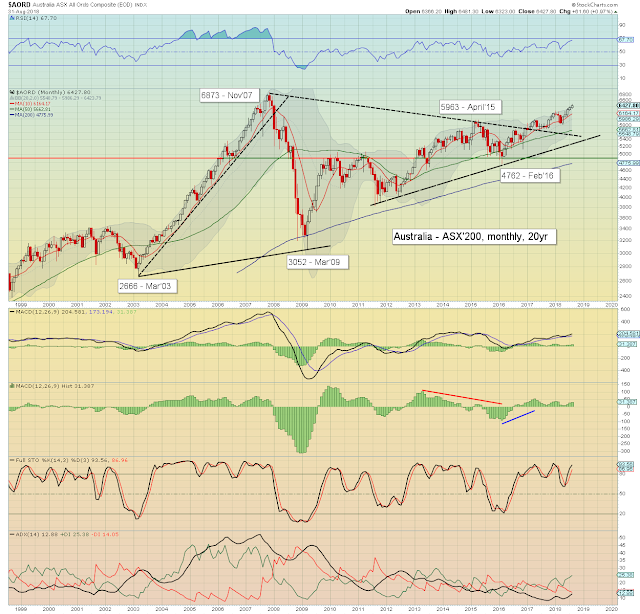 Note the key 10MA, currently at 24850, and rising by around 250pts each month. 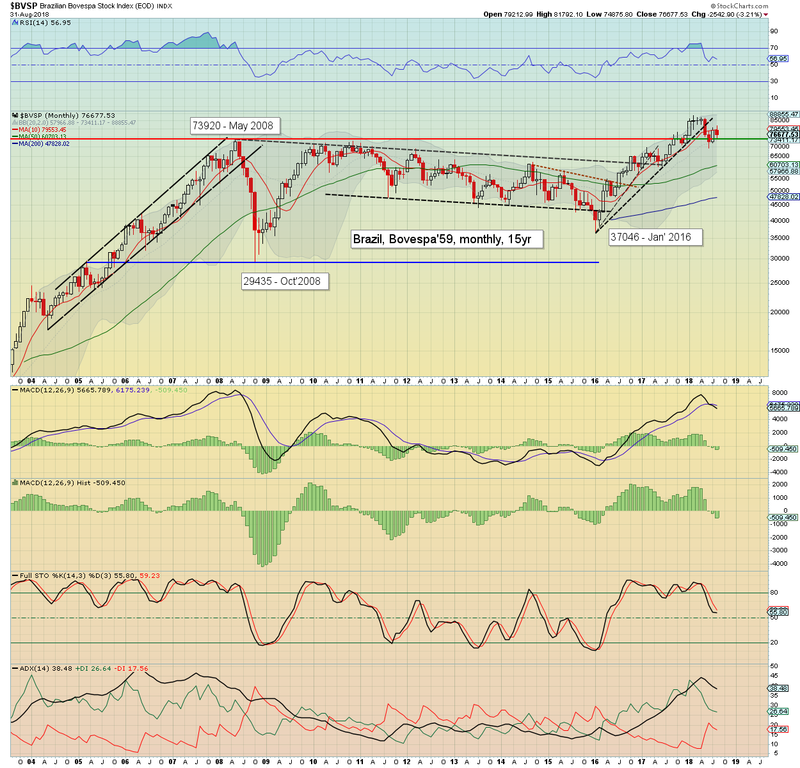 Unless we see a monthly close under it (which in Sept' will be around 25100), the equity bears can't get confident that we have a grand top from the 2009 low. 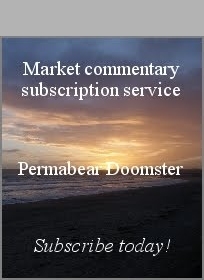 Never mind other issues, such as econ-data, corp' earnings, or the yield curve, none of which are a concern right now. 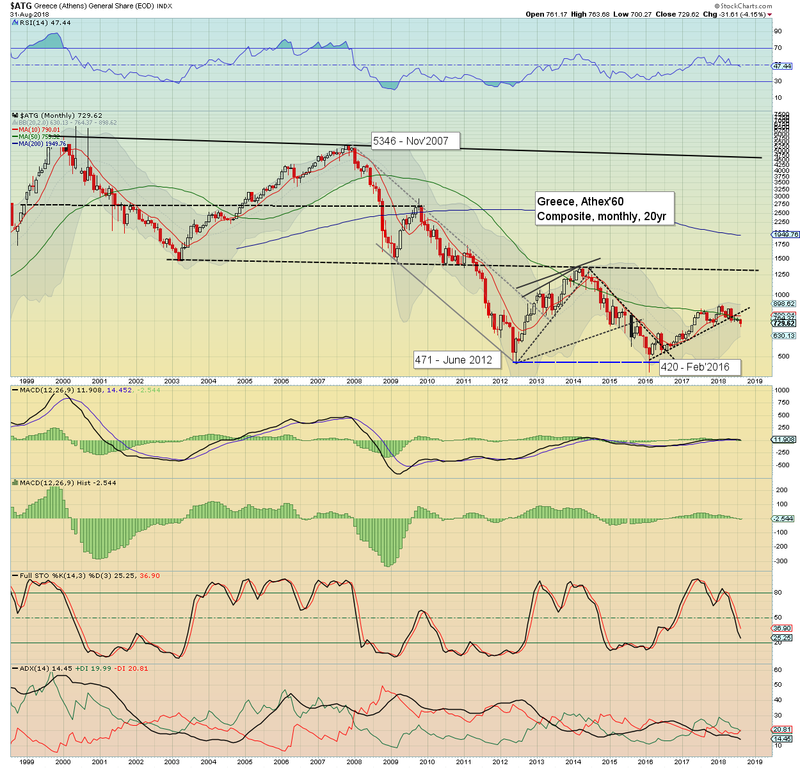 The economic powerhouse of the EU - Germany, saw the DAX settle -441pts (3.4%) to 12364, notably under the key 10MA. Price action has been relatively narrow range since May. 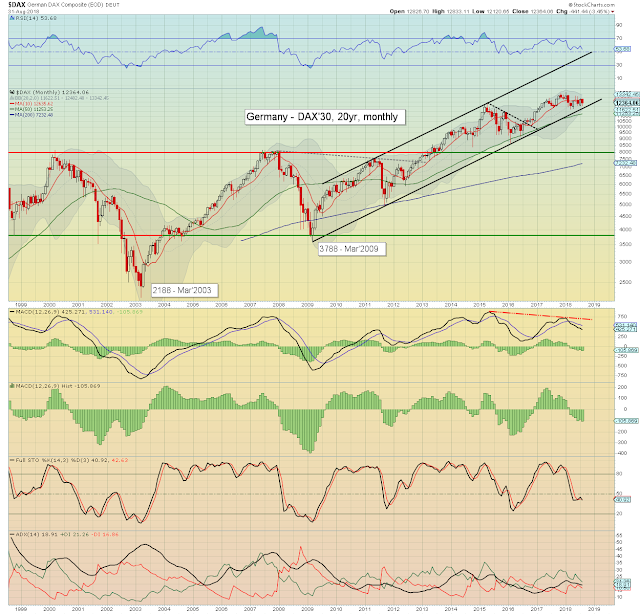 For the moment, the DAX is at least holding above core rising trend, which from September onward, will be around 11900. Any break of that trend would offer a major retrace to 8k, which is a clear third lower. German financials - not least Deutsche Bank (DB), continue to suffer via the NIRP policy of the ECB. Its already been stated that rates will stay around -0.4% until summer 2019, and that sure won't help this struggling sector of the Germany economy. 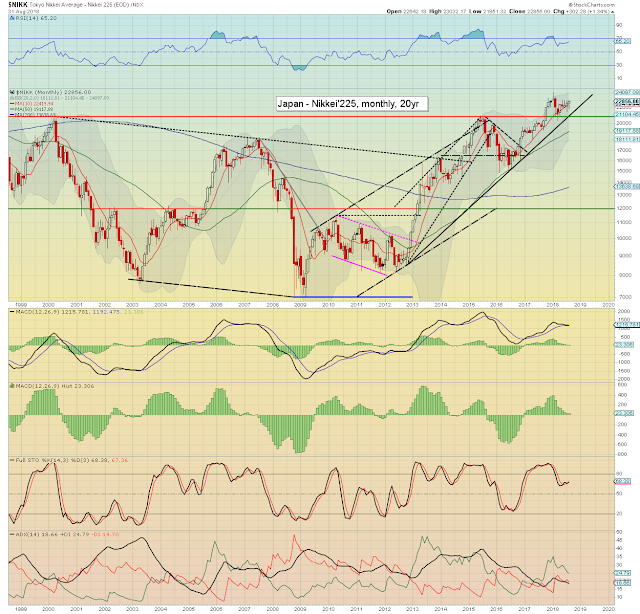 The Japanese market climbed for the 4th month of 5, settling +302pts (1.3%) to 22856. 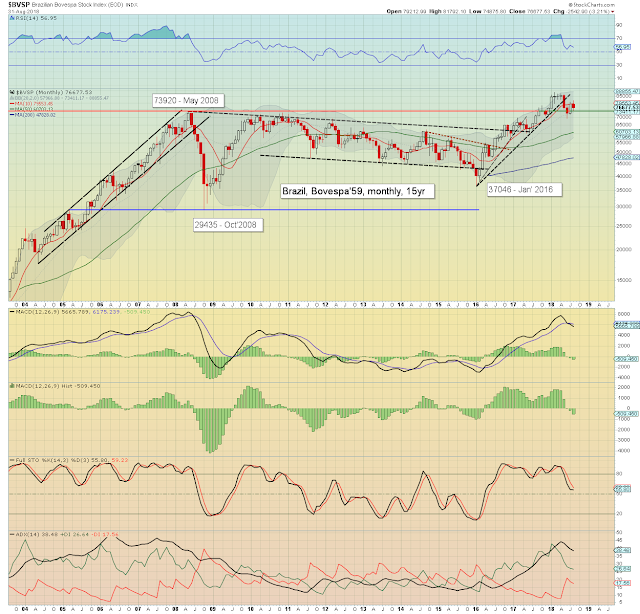 The most recent two monthly candles both have spiky floors, suggestive of renewed upside. 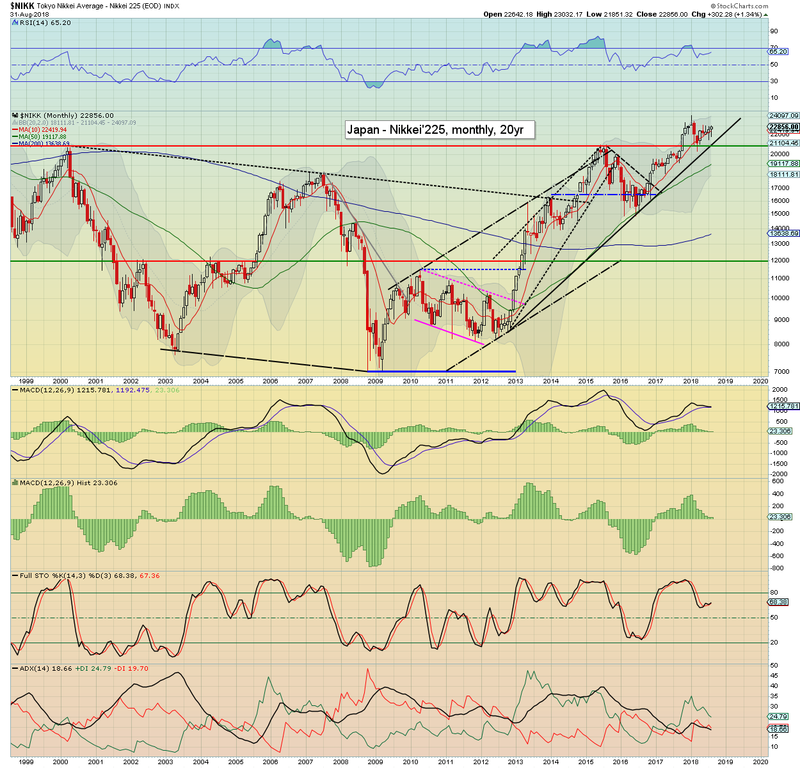 Much like the US DOW, the Nikkei has avoided a bearish macd cross. A new multi-month up wave is viable, that could carry things higher all the way into spring 2019. 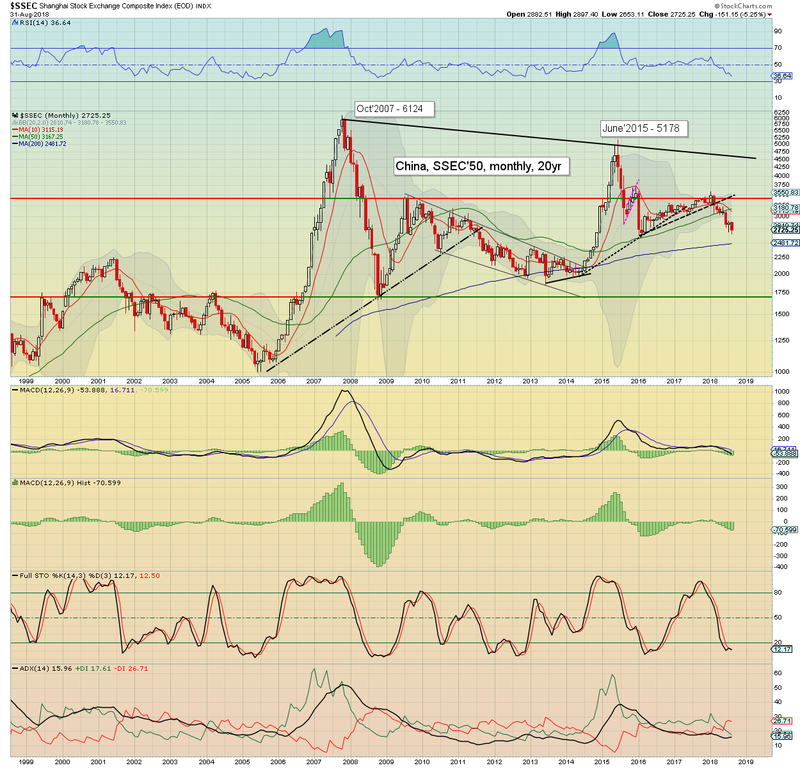 The Chinese market cooled for the 5th month of 8, settling -151pts at 5.2%, having notably broken a low of 2653, just 15pts above the Feb/Jan' 2016 low. There is zero sign of a floor/turn. If 2638 is taken out, next stop would be psy'2500, and then 2K. The communists will clearly want to stall this decline at some point (no matter what the costs), but for now... there is no sign they are particularly concerned. It could even be argued, the communists leadership of President Xi is happy to see the 'speculative capitalists' punished via lower stock prices. 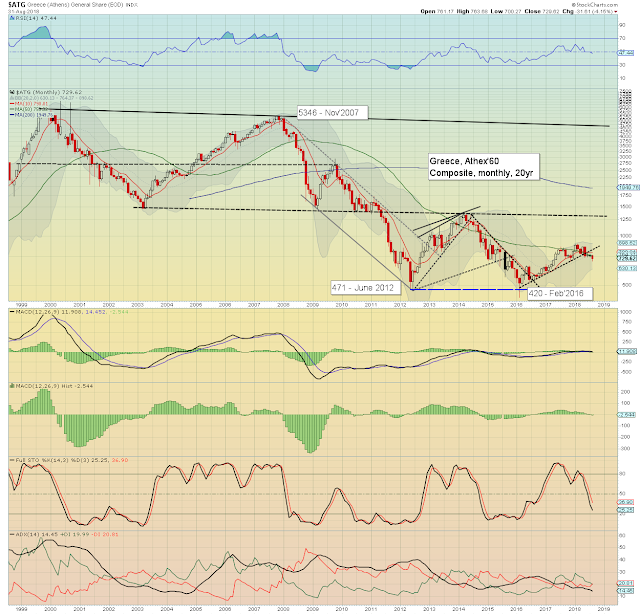 The Brazilian market resumed lower, settling -2542pts (3.2%) to 76677. It could be argued price structure across June>August is a multi-month bear flag. That would be decisively confirmed with any price action <69k. 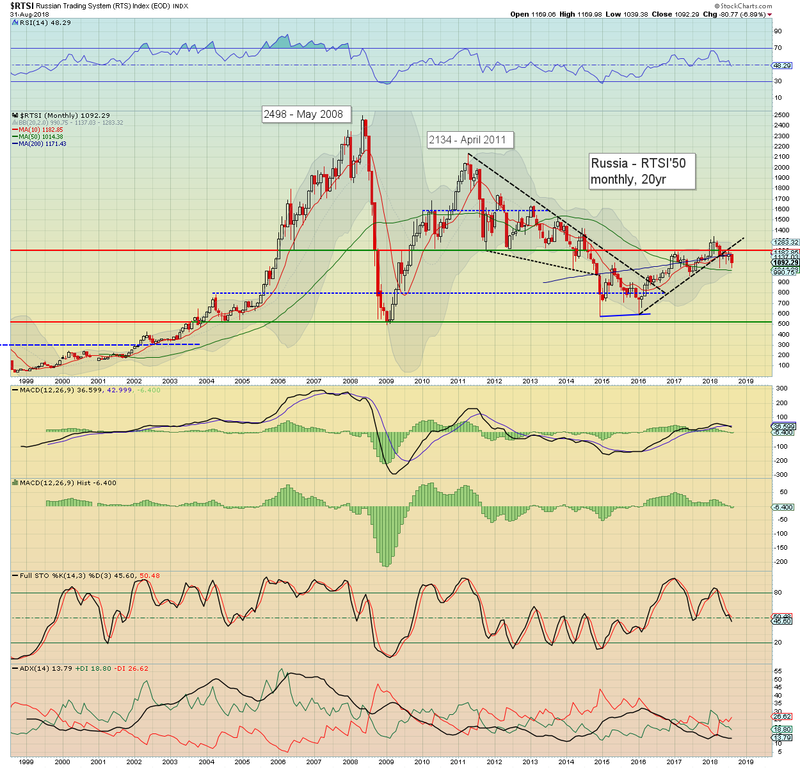 Russian equities were the weakest market (of the ten I highlight) this month, with the RTSI lower for the 4th month of 6, settling -80pts (6.9%) to 1092. 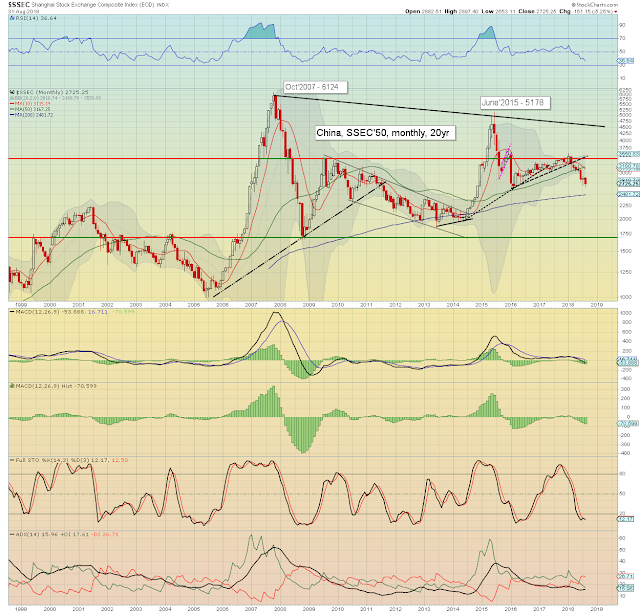 S/t outlook remains bearish, and would only turn bullish if the 1200 threshold can be re-taken. French equities struggled in August, settling -104pts (1.9%) to 5406. Price action has been broadly choppy since Oct'2017. Things would turn bullish with a monthly close >5600, or bearish <5200. Its notable that price momentum is outright negative (if only fractionally), and we have a divergence across 2015>2018. The Spanish market is holding within a m/t downward (if very choppy) trend from May 2017. August saw a net decline of -471pts (4.8%) to settle at 9399, the lowest close since Jan'2017. Note how the 10MA has been acting as key resistance across this year. Until that is re-taken, the Spanish bulls have little to be pleased about. There is background chatter that if Turkey defaulted on its debt, the Spanish banks would be particularly hit. The Australian equity market climbed for a fifth consecutive month, settling +61pts (1.0%) to 6427, the highest settlement since Nov'2007 - when the market peaked at 6873. 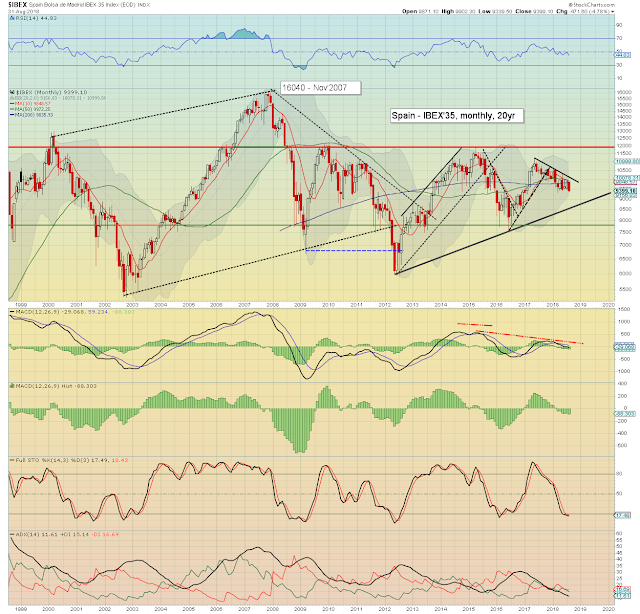 Indeed, a challenge of that historic high appears probable within 3-5mths. Some renewed strength in commodity prices would help accelerate this market. The economic basket-case of the EU - Greece, saw the Athex settle -31pts (4.1%) to 729, the lowest close since April 2017. The broader Greek economy remains extremely dependent upon the infamous Troika, with a national debt that will of course never be repaid. Just reflect upon the horror that the Athex is currently -84.9%, from the Nov'2007 peak. Three markets were net higher, whilst seven saw net August declines. The US, Japan, and Australia were strongest, whilst Spain, China, and Russia were the laggards. Whilst it was indeed a mixed month - leaning on the weaker side, the mid/long term bullish trends in most markets are still intact. *the next post on this page will likely appear 5pm EDT, Tuesday Sept'4th.